ChurchSurfer @ Saint Martin of Tours Episcopal Church: All Dogs Go To Heaven? We pulled in to the parking lot of Saint Martin of Tours Episcopal and Larry, who is a lousy car rider only because he gets so excited that he does this annoying grunt/whine thing anytime you slow down and/or turn (because that obviously means something is about to happen), was already worked up into a frenzy. We opened the door and he jumped out in full alertness mode, not recognizing the place at which we had arrived. He darted around nervously at leash’s length while we gathered our Bibles, pens, and notebooks and then we all headed toward the building. 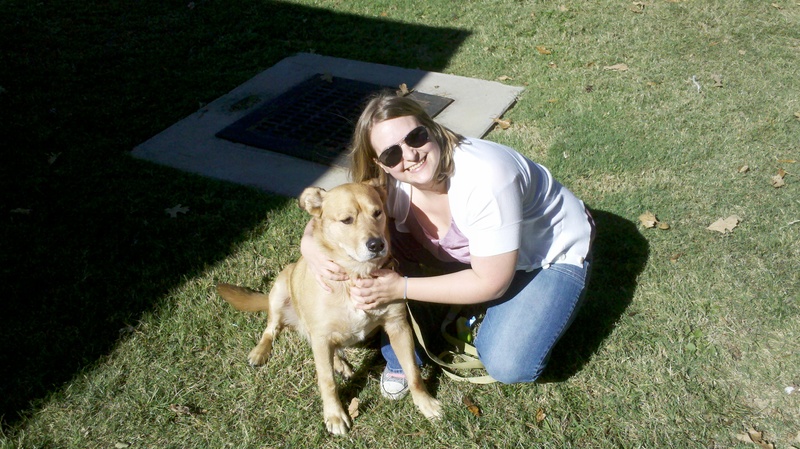 I put Laura in charge of picture taking duty for the day so that I could keep hold of the leash…Larry obeys me better, especially in public places. He is actually a very well behaved dog and I invested a lot of diligent training time into him, making sure he wouldn’t do all the typical canine behaviors that I find annoying like begging for food, sniffing crotches, jumping up on people, etc. He’s not perfect and slips up every now and then, but always responds immediately to correction, which is why I am comfortable bringing him to public events such as a church pet blessing service. We headed toward the front entrance but then realized that everyone with a pet was going around the side of the church, so we decided to follow the crowd. 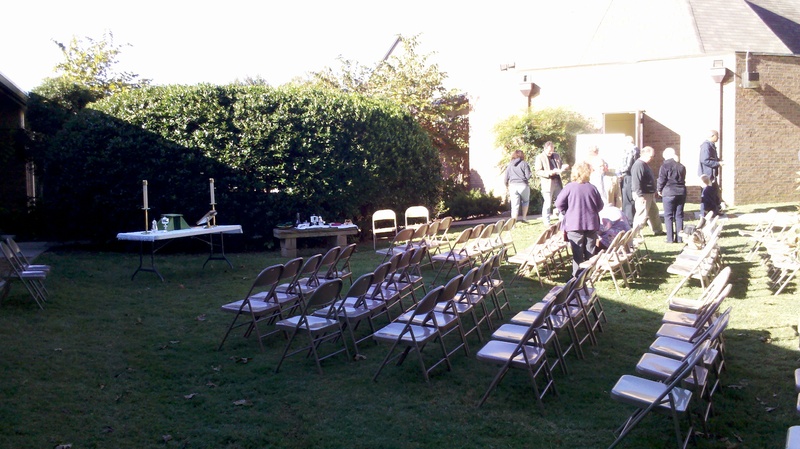 As we rounded the rear corner of the church we saw rows of chairs tucked into a nook in the back yard and realized the service would be held outside. Had we known this, we would have dressed more appropriately because although it was a beautiful sunny morning, the air was crisp and cold. Laura and I both had worn short sleeves, so we tried to stay in the sun as much as possible to keep from getting too chilly. 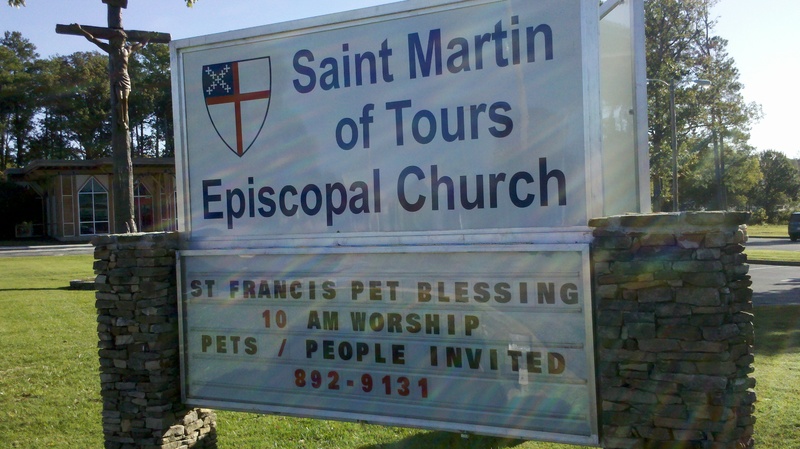 St Martin of Tours Episcopal is a beautiful brick structure surrounded by tall skinny pine trees, and as the sun rose in the morning sky peeking through branches and pine needles I marveled at the bond that we humans have with the other plants and animals of God’s creation. Standing in the church yard were dogs of all sorts and an assortment of other animals including a rabbit and a horse, all accompanied by their human owners. It was pretty amusing to watch the contrast in socializing that was going on…people shaking hands and saying hello’s while their canine counterparts sniffed rear-ends and whined at each other. 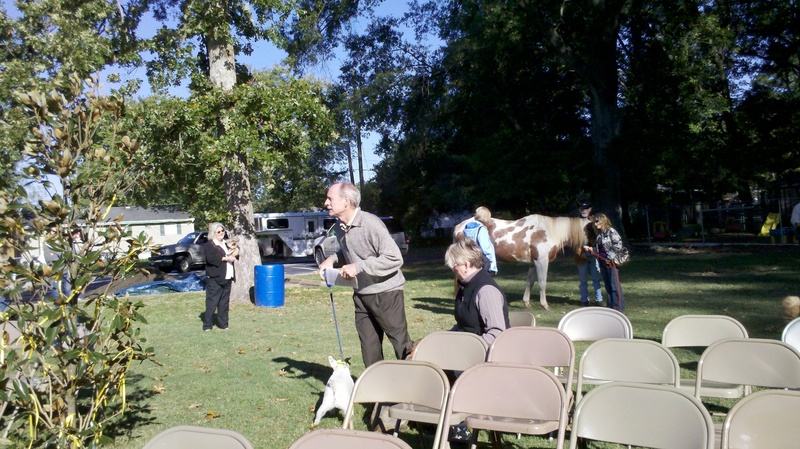 The pastors were greeting everyone with a warm welcome and dog treats, but Larry was too interested in all the other dogs and people to worry about eating a snack. After a few minutes of socializing, everyone took seats and the service began with the reading of prayers and Psalms. It seemed like most of the pets settled in and behaved well, with an occasional whine, bark, or correction from a pet owner. As the service progressed I noticed a steady stream of animal hair floating through the bright rays of the morning sun, and a siren in the distance aroused some barks and howls from the animal audience. The pastor made his way through a humorous “squirrel-in-church” story and explained points about Saint Francis of Assisi, who this service was meant to honor, and what it means to live sacramentally. He explained that living sacramentally is to live on behalf of something else, and he related the way that our pets need us and live to please us to the way we should live for Jesus Christ. Instead, we are too often narcissistic and build our lives around our own priorities rather than putting God first and other people second. My level of concentration was constantly challenged throughout the morning service by a stocky brown and white bulldog sitting in front of us who stared intently at me and Larry all morning long, going through a series of intentionally distracting tactics such as whining, tail wagging, making cute faces, and inching closer and closer to us on its belly. 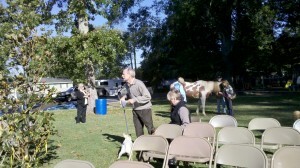 The bulldog obviously wanted to play, and Larry would have happily obliged had I given him the OK. After the pastor’s message the congregation received communion and brought their animals with them for the pet blessing. The aisles slowly filtered down to the front and it gave everyone a chance to see each pet as the procession moved down the center aisle. The final blessing was for the horse, which was brought in from the side rather than down the middle, and the pastor offered it a couple of the communion wafers but the horse was not very interested in them (I can’t blame it, and if it wasn’t for the meaning of communion I don’t think any of us would actually eat communion wafers…they are akin to styrofoam). The service leaders, which included a couple of women who looked super-cool donning over-sized black sunglasses with their ceremonial white robes, concluded the service by giving out a few “pet awards” for the biggest, smallest, most unusual, etc. and then auctioning off the remaining dog treats. After the service, people seemed more willing to hang around and spend time socializing with each other rather than rushing off to get on with the rest of their Sunday. It was very interesting for me to see the extra dimension that was added to my church experience and the way I related to all these new people and their animals. Having our pet companions with us gave me extra insight into the everyday home life of all these people that I would have never seen otherwise. It also helped me to have something in common with them and a way to relate to them and initiate conversation. When a dog does the introduction for you, it can make an awkward social situation (not that church is awkward for me, but it could be to someone else) suddenly very tolerable. I wondered if the church environment has become (or maybe has always been?) too “sterile” and therefore too divergent from our home lives for us to feel truly comfortable or at ease while we are there. Do we lose some of our personality when we go to church? What if we do…and what if the root cause is that for those of us who were raised in a church-going family we can recall from our earliest childhood memories getting dressed up in “church clothes” that were different from what we wore every other day, we were told to be on our best behavior, we couldn’t be loud, we couldn’t run and play, we couldn’t be kids in church? I am not saying that well behaved kids are a bad thing (and I point to the fact that I expected my dog to behave so that we could all focus on the church service), but what if the whole act of going to church as children conditioned us to stop having fun there? What if it conditioned us to lose part of our personality there and become stoic? What if it conditioned us to care too much about our appearance and how we may be perceived by others if we don’t fit in with the “norm” and behave in a certain way? It seems to me like in a world where each individual person is so unique and all of our quirky little eccentricities that make us who were are (and usually what makes each of us so special to one another) are too often white-washed away as we get “cleaned up” for church. We have been conditioned to believe that we can’t have fun at church. We can’t let our hair down and be the same person we are every other day of the week. Maybe if there was no pressure to look or act a certain way at church people would want to be there more often. Maybe non-Christians would want to be there as well. I don’t want to distort my point here…I am definitely not saying the church should become more worldly, I am just saying that when we build churches, we are not replicating the Temple of Jerusalem. There aren’t Levites inside who are bound by strict rules about cleanliness, ceremonial practices, and codes of conduct…but we sure do act like it. The local church is not a club. It is not a bar. It is not a party room. But that does not mean we can’t have fun there! The local church is like life…there are fun times, serious times, tragedies, celebrations, pain, sorrow, happiness, joy, worship, and everything else that happens between birth and death. We should stop taking ourselves so seriously and loosen up. Dance a little. Shout to the Lord. Lift your hands to heaven and sing praises to God even if you don’t have a “choir voice”. Clap your hands and jump up and down. There will still be plenty of time for singing soft hymns, silent meditation, prayer, and seriousness. Bringing pets to church seems like a great way to bring a little more of ourselves with us. Why don’t we do it more often? What are your thoughts on the matter? What things does your church do to bring your personality out? Maybe you disagree completely and feel that church should remain unblemished and sacred. I’d like to hear some feedback…let’s discuss. If you enjoyed this article, please click the Google +1 button at the top or bottom of the page to help others find it also. Please share the ChurchSurfer blog with anyone you know who may be interested, and I also invite you to connect on Facebook and Twitter. Please post comments below, and you can email me directly at josh@churchsurfer.com. As far as animals in the church sanctuary goes, I feel that the only time this is appropriate is maybe during a Christmas play. The only exception to this is those that are blind and have seeing-eye dogs. That said, I don’t see a problem with animals at church in general as long as the sanctuary is a respected place that animals are generally not allowed in and the animals are elsewhere in the building. Josh, I agree that churches have become so sterile but that is mainly due to how technological our churches have become. In the olden days when we had no electricity and no Air conditioning, churches where less sterile because on a hot day the windows and doors to the church were often left open during services (which allowed animals to come in, but hey maybe the sqirrles wanted to hear the gospel too), the windows let natural light in instead of using artificial light, and without all the tech to be abused in a church service. This led to a less sterile and more homey church vibe that today quaint. Now technology is only a part of reason for churches being so sterile. Another is the fact that too many churches can’t find the balance between tradition and change. Plus you have to find a balance between sticking to the service plan and following the lead of the Holy Spirit.